Getting in touch with a reliable moving company in Goodmayes might have used to be a tough job, but fortunately for you it is not so any longer. 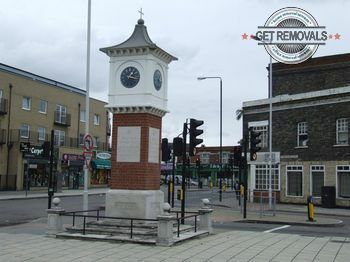 We have established ourselves as a small locally owned and operating contractor several years ago and since then we have been offering the local community the best professional removals in Goodmayes. We know how we are supposed to do our job, and we do it precisely in that way. We are responsible and very reliable, efficient and we work on very affordable prices. What more is there to want from the contractor who is going to carry out your home relocation in Goodmayes? We work in accordance to methods we tailored ourselves, using our extensive experience in the business. We drive clean vans with safety blankets, specialized tools and equipment, GPS navigation and the manpower to do all the heavy lifting quickly and hassle-free. Our licensed and trained technicians work on a flexible schedule that is considered entirely in accordance to your comfort and peace of mind. We can do the packing of your items for you, or if you prefer to do the job yourself, you can purchase high quality professional packing materials from us and always count on a tip from our experts how to complete the task more efficiently. We carry out domestic and commercial projects, as well as single item pickup and delivery, storage and rubbish removals. Our custom pricing system offers some of the best prices for removals Goodmayes has available. In addition, we offer mid-week discounts that make our services even more affordable. Get in touch with our around the clock custom support for booking your relocating experience with us, or request a free no obligation quote for the full value of your project. We would be more than happy to help you make your life easier and free of any stress and strain whatsoever. The suburban development of IG3 Goodmayes in the borough of Redbridge is definitely one of the finest residential areas in London today. It is a relatively new district. The first major developments here began in the end of the 19th and the beginning of the 20th century. The atmosphere of the prevailing Victorian and Edwardian architecture in the area is magnificent. Goodmayes is very well known as being the place with probably the highest concentration of scout groups in London. The kids from the age of 6 to 14 are welcomed to the 4th Goodmayes Scout Group, the oldest and most prestigious among them. It has been established some 90 years ago, and definitely has much to do with the overall strong community spirit that is clearly visible in Goodmayes. If you are looking for a nice suburb to move into with your family, then Goodmayes should definitely be on your list of places to take into serious consideration – as close to the top of the list as possible.